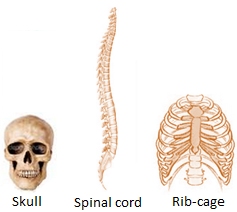 The skeleton system performs a specific function in the body. A skeleton is made up of bones which are inside our body. 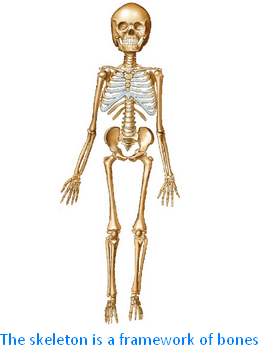 There are 206 bones in the human body which make the skeleton system. This system gives shape to our body and also support and protect our body. Due to our skeleton system we are able to keep our body in proper position that allows us to sit, stand, walk, run, etc. The skeleton also helps the bones and muscles to be in proper order. Bones also protect the delicate organs of our body. For example the skull protects the brain, the back-bone protects the spinal cord, the rib-cage in the chest protects the lungs and the heart.